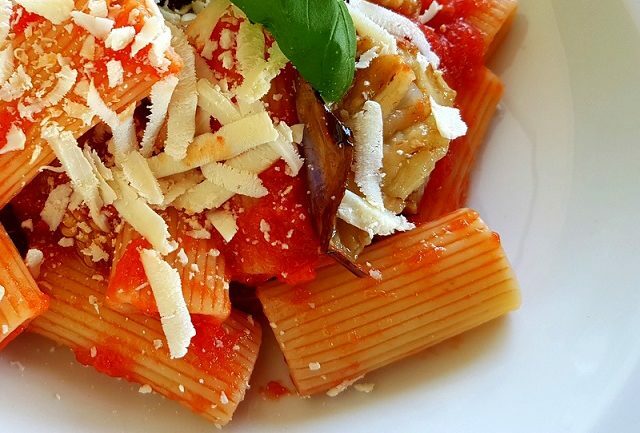 Pasta alla Norma is a very simple but tasteful dish, originally from the city of Catania in Sicily. 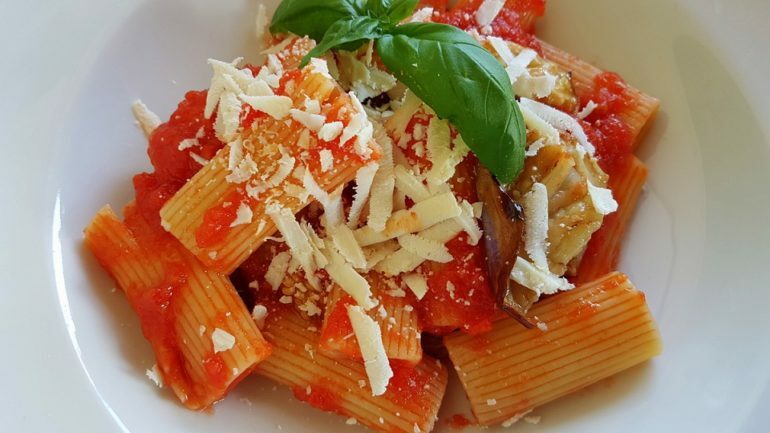 It is usually made with pasta tubes such as rigatoni or penne rigate seasoned with tomato sauce and with the addition of fried eggplant, salted ricotta and basil. 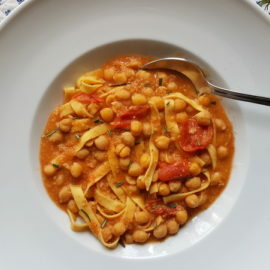 I have to confess that before meeting my Sicilian hubby, I had never eaten pasta alla Norma. Now, of course, I have lost count of how many times I’ve enjoyed this classic Sicilian pasta dish, which is so incredibly satisfying and full of Mediterranean flavour. My hubby has cooked it for me, his mum and sisters have cooked it for me and I’ve eaten it in Sicily. But I have never cooked it myself, at least not the classic version. I have made an ‘alla Norma’ baked lasagna which was pretty good! But, this is my hubby’s recipe and since he hails from Catania, I guess you can’t get much more authentic than this! 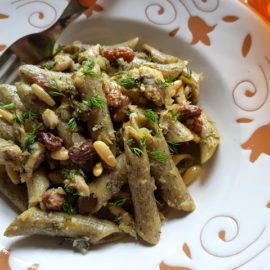 There are a number of other pasta alla Norma recipes out there which include ingredients such as capers, wine, onions, pecorino etc. but, the classic alla Norma is extremely simple and makes use of only a few ingredients. A little pasta alla Norma history. There are a few theories on how this dish got its name in honour of the opera ‘Norma’ by Vincenzo Bellini, who was born in Catania. One commonly quoted story is that the name was created by Nino Martoglio, a Sicilian writer, poet and theatre director, who loved this dish so much that he compared it to Bellini’s operatic masterpiece. Another story is that while Bellini was writing his masterpiece, he regularly went to a restaurant and ordered just this dish of pasta, so the owner finally named it after the opera in honour of his famous customer. Some say that at that time, the dish was plated in a slightly different way to make it look like Sicily’s famous volcano, Etna. The eggplant was placed at the bottom, a hill of pasta was piled on top of the eggplant and the tomato sauce with grated ricotta salata covered everything! Introduced to Sicily by the Arabs in about 1400, eggplants are to Sicily what potatoes are to Ireland. 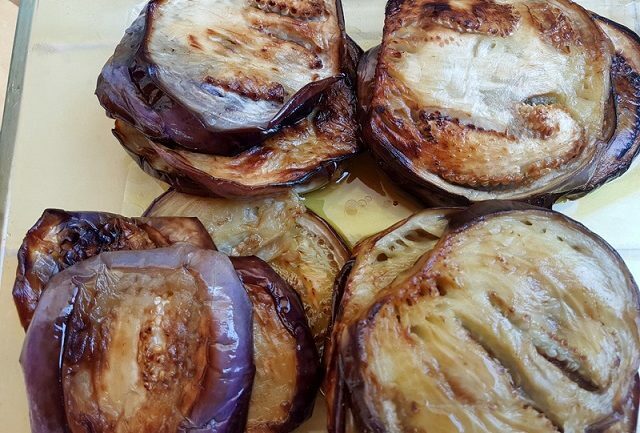 There are three main types of eggplants found on the island; the very dark oval or long ones that most people outside of Italy know, oval zebra eggplants which have a lighter striped skin and the more rotund, lighter coloured Sicilian eggplant, which is what my husband used for this recipe. This eggplant has a dense whiter flesh and less seeds than the more common eggplant, but, of course, you can use either. 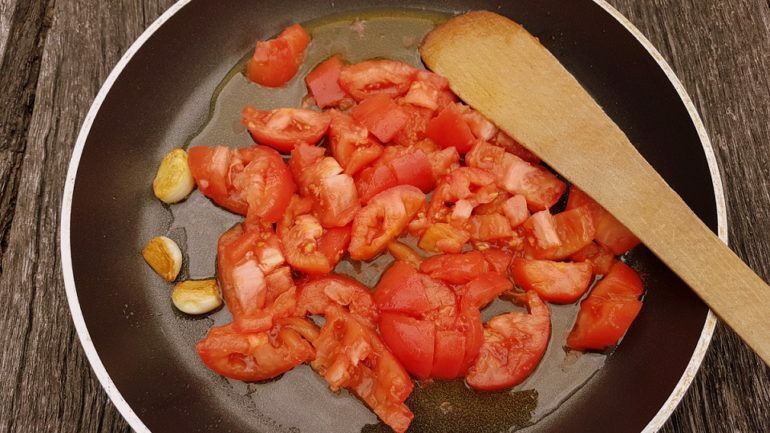 When it comes to the tomatoes, fresh is best especially if you can get hold of San Marzano tomatoes. However, a good quality Italian passata rustica or tinned whole tomatoes from Italy work well too. 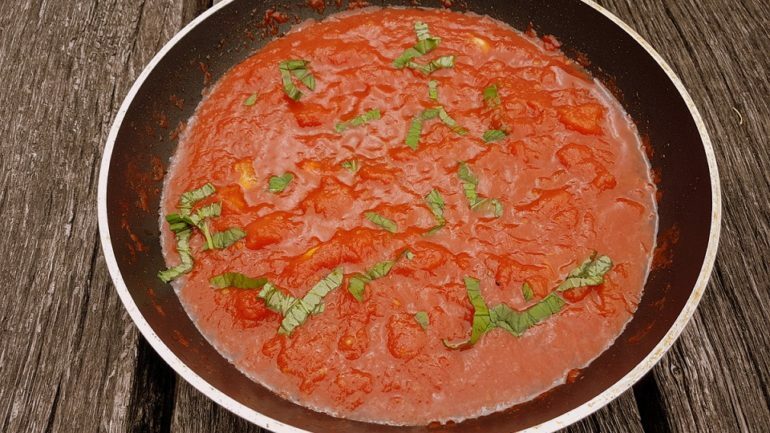 Alternatively you can use a mixture of fresh tomatoes and passata. 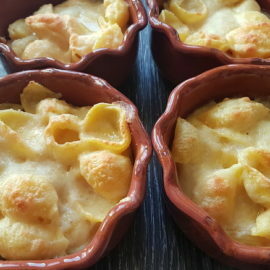 As with many pasta recipes, cheese is more than mere seasoning for pasta alla Norma. You can’t have it without the cheese which really should be ricotta salata. This is a typical Sicilian cheese. The word ‘ricotta’ means re-cooked and ‘salata’ means salted. Ricotta Salata is cheese made from the whey part of sheep’s milk, which is pressed, salted and aged for at least 90 days. It is milky white in colour with a firm texture and salty taste. Ricotta salata can be bought from Italian speciality food shops or online, but if you can’t find it, you can use feta, preferably aged feta. You will need to let the feta dry out a bit before grating it. Just pat it dry with kitchen paper and leave it to dry out at room temperature for a couple of hours. 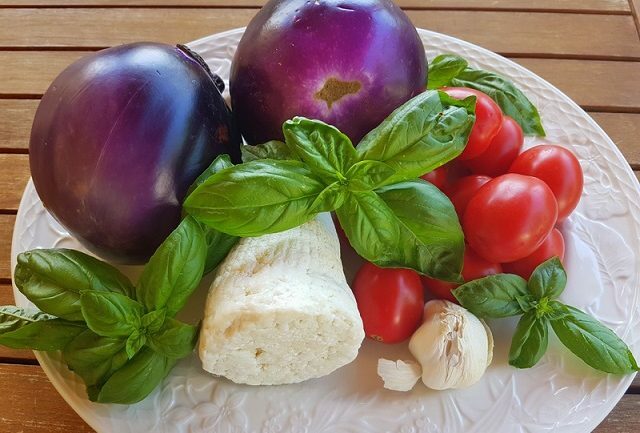 In typical homes in Catania, families traditionally place the remaining ricotta salata with the grater and a plate with extra fried eggplant slices in the middle of the table. As they eat, they often add extra cheese and eggplant along the way! Not a bad idea!